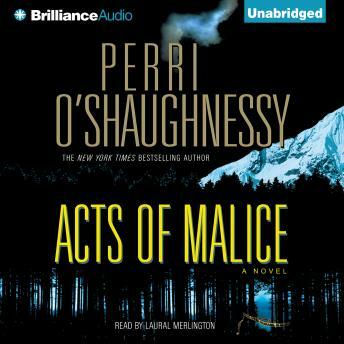 Set amid the darker side of Lake Tahoe's glamorous ski resorts, Acts of Malice has Nina taking on the case of Jim Strong, a member of South Lake Tahoe's most prominent families and the owners of the posh Paradise Ski Resort. With his brother Alex recently killed in a headline-making accident that occurred while they were skiing together, Jim fears he may be indicted in the death. When the coroner announces that Alex died from injuries unrelated to the accident, Jim is charged with murder. As Nina prepares to defend her client, she has no idea that this case will lead her into a terrifying confrontation with a psychopath or threaten all that she holds most dear. She never expects to witness the perplexing and tangled set of loyalties and alliances among the Strong family. Further complicating matters is Assistant District Attorney Collier Hallowell, back from sabbatical. Determined to put Jim Strong behind bars, he's equally resolved to pick up romantically where he and Nina left off - and to take their relationship in a completely new direction. Another one of the Nina Reily series by Perri O'Shaughnessy. I enjoyed the fast pace of the book but it was much too short. I seem to always say that when I review an abridged version of a book. This story points out that not all the clients are not guilty. As an assistant in a law office, I love these books. I just wish this one had a few more details . . . felt like it was missing something but overall, another fun Nina story and not far off from the drama of some law offices.